Soon after the German invasion of the USSR in 1941, Wehrmacht units encountered new Soviet tanks, the medium T-34 and the heavy KV. Thick sloped armor of these vehicles gave them good degree of protection against German anti-tank weapons. The situation eventually led to requests for more powerful guns that would be able to destroy the aforementioned tanks from long range. Since Germany already had a suitable design, the 7.5 cm Pak 40, it entered production and in November 1941 first pieces were delivered. But until enough of those would be manufactured, some expedient solution was required. Rechambering for a more powerful round. The German cartridge was nearly twice as long as the Soviet one (715 mm vs 385.3 mm) and wider (100 mm vs 90 mm), resulting in 2.4 times larger propellant load. Controls were moved to the left side of the barrel, near the sights. Maximum elevation angle was limited to 18 degrees. The carriage was equipped with a new, lower shield. Many (but not all) guns were fitted with muzzle brake. 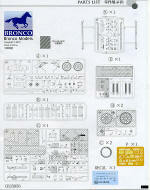 Bronco's kit of the PaK 36(r) is molded in a nice tan plastic. 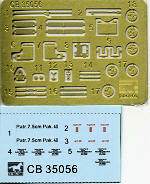 It seems to have all the bits for the Soviet F-22 piece plus additional sprues for the German upgrades. This includes a section of ammunition and cases (which is why there is a decal sheet included). Like most field pieces of this size, it is not über-complex and in fact, would be a great introduction kit for those wanting to try their hand at something besides aircraft, ships or cars. This particular kit is one that includes the muzzle brake, though I imagine one could use the original barrel for one without. The gun is designed so that it can be elevated so one needs to be careful when constructing that part of the kit. I also found that the photo etch fret included is quite appropriate for this sort of kit, composed mostly of bits to hold on the shield or used for various bits on the trails. The kit also includes the more modern wheels used by the Germans, these having separate tires so painting will be eased by this. The gun can be built either in the transportation or the firing position. Unfortunately placement of parts on the trails makes it impossible to build it where one can convert with ease. Instructions are superb. In addition to crisp construction drawings, any additional color info aside from the overall shade is provided during construction. There are also a number of detail illustrations to help out. Many of these are of what the p.e. bits look like after folding, a nice touch as is the full color used throughout. Basically, this one is painted Panzer yellow, though I'm sure that some of these were camouflaged in the field. Decals are for the ammo boxes and are nicely done. 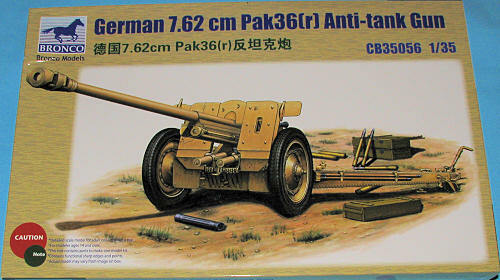 Artillery fans will be quite pleased with this one. The crisp molding and easy to follow instructions will ensure a superb replica when one is done.